This year would probably be one of the years that would make or break me (or just prepare me for something big) because I'm now in my early 20s and I just can't dwell on what I really want to pursue. I set foot in the real world last year and it has affected my way of living of which decision making turned into a battle between survival and my own satisfaction and happiness. And I don't want to sacrifice my own satisfaction and happiness anymore. So with that, I have decided that I should make 2016 my year of "really" going for my dreams no matter what. So here is a list of my goals and dreams this year. Hopefully, all items will be crossed out by the end of the year. Fingers crossed because I'm going all out to achieve them all this year. 1. Bring back my flexibility. Stretch, stretch, stretch!!! In 5 months, it would mark my 6th year of having no formal ballet training which means I probably lost my flexibility and strength and muscles for dancing. And that's extremely bad. I've been attempting to do this for that past years but school and other stuff took over my time. 2. Dance ballet again. After item no.1, of course expect a big comeback! I tried last year but it didn't work out. I strongly feel that I should be back in ballet this year and I should turn this into reality. 3. Find a high-paying job that will not take away my happiness. or just find a job that will make me happy. I just want to use my skills and talent to the extent and be happy with what I'm doing. 5. Visit more art exhibits and design expos. 7. Dye hair (full hair) unusual colors such as light blue, teal, green, pink, gray, two tone, etc. I want to try this ever since. If it's not acceptable in the society I'm in, then I don't care. If it kills my hair, then I don't care (actually, I still care, but you know what I mean). At least no regrets on this one in the future. 8. Watch more concerts. The thing is, whenever my favorite singer or band is in town, I always attempt to buy the most expensive ticket!! I do whatever it takes to go VIP. I also attend album signings. Fangirling to the highest level. It's just that experience and memory are more valuable to me than investing in gadgets and other expensive materials. 9. Watch theater plays and ballet shows. I rarely watch theater plays and ballet shows mainly because I was used to being in the backstage. I never really had the plunge to watch since my thesis. But I've always wanted to be in the spectators' view. 10. Write in a design magazine or design blog. 12. Join art shows or exhibits. Time to get my art out there. I don't care if someone will actually like it. I just want to get it out there. 13. Get my book moving forward. I had this crazy idea few years ago and I already started writing it. But it had been neglected and I want to continue this dream of mine. 15. Read more books. Work made me forget my love affair for books. I haven't even visited book shops as often as I did before. And I have a lot of unread books. So I want to read more books this year and bring back my old, nerdy, bookworm self. 16. Paint more masterpieces. Similar to no. 15, work set my art aside. So if I want no. 12 and no. 11 to happen, this shall be done. But to be honest, I want to paint more masterpieces this year because (1) self expression and (2) to develop my skills even more. 17. Make my blog a tool of self-expression and a tool for sharing my ideas. Honestly, I no longer have any idea on what's the purpose of this blog anymore. But I want it to go places. So I will find the time to sit down and reflect, analyze, and "talk" to my blog. 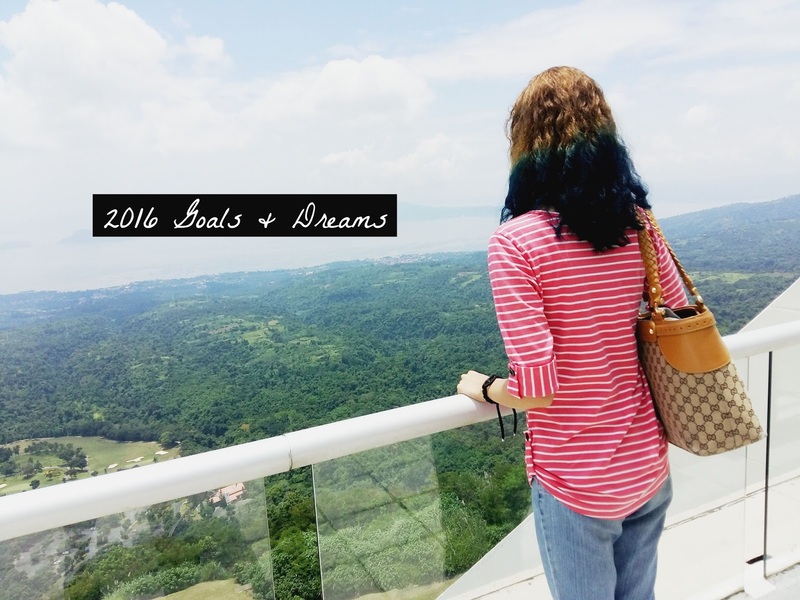 What are your goals and dreams this year? Happy New year everyone! Great post! Doing ballett is on my list too! Great goals, I'd love to visit museums and watch theatre too, especially ballet, maybe next time I'll be able to watch a ballet with you in it! I wish you much happiness in this year and I hope you will make this year your own. Love he goals! Hope you can reach it! I feel like I lose sight of my dreams often because I sacrifice my happiness for people, but like you, those shall be gone this year; cheers to dreams and happiness, Rae! I think getting back into ballet would be a fantastic idea. With performing arts, I think there's always the thing of "we've spent so many years practicing for this" that harps at the back of our minds, urging us to return to the art we've worked so hard for. I'm a violinist and have played for about 5 years before stopping formal lessons last year after completion of my Grade 8. I've been very sporadic with my own practicing ever since and am pretty terrified of losing the skill I've worked so hard to acquire. Ill definitely be trying to get back into music this year! I hope the talk with your blog works out, by the way, because I'm a firm believer in blogs being an extremely wonderful place for ideas to breed. That said, I'll be following on your journey this year, Rae, and I'll be rooting for you. Cheers to dreams once more!